Four County Auto Service is conveniently located in Mt. Airy, MD not far from Sykesville. We are called Four County Auto Service for a reason! We offer auto repairs to customers in Frederick, Carroll, Howard & Montgomery County Maryland. With over 50 years’ experience, we providing quality preventive auto maintenance and auto repair services on all makes and models of vehicles. Our ASE & factory trained technicians are fully committed to the satisfaction of each and every customer. At Four County Auto Service, we stand behind our reputation for reliable, trusted auto repairs at fair prices. Four County Auto Imports, you’ll find ASE & Factory Trained auto repair professionals experienced in all makes and models of vehicles, friendly service, reliable diagnostic services, and affordable auto repair prices conveniently located near Sykesville, MD.. We offer a shuttle service (limited area), towing, and a warranty on parts and labor for your convenience. 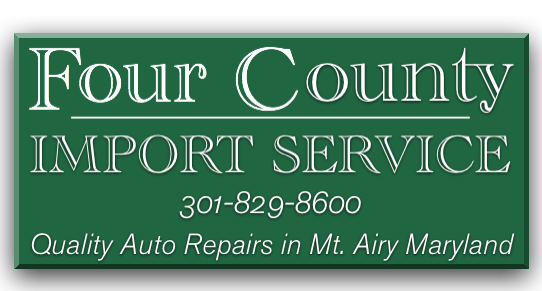 Four County Auto Imports, conveniently located near Sykesville, MD, has over 50 years’ experience providing quality preventive maintenance and service on all makes and models of vehicles. We specialize in factory recommended service utilizing genuine factory parts. Our ASE certified mechanics in our Mt. Airy auto repair facility can handle any repair job and are experienced in preventative maintenance on all makes and models of vehicles. Being without Air Conditioning in your vehicle during Maryland summers is less than comfortable, to say the least. Bring your vehicle into Four County Import Service for quick and affordable auto AC repair near Sykesville MD. We offer auto AC repair to customers in Frederick, Carroll, Howard & Montgomery County Maryland. Maintaining and repairing your vehicles engine, should only be left to professionals like the skilled mechanics at Four County Auto Imports. If you need your engine repaired, replaced or rebuilt near Sykesville, MD, bring your vehicle to Four County Import Service. We offer engine repairs to customers in Frederick, Carroll, Howard & Montgomery County Maryland.